Ellis Island Yoko, Bono and Me. I was invited to Ellis Island as a guest of Art for Amnesty International to participate in an event to inaugurate John Lennon Day and the unveiling of a 'Thank You' Tapestry to Yoko Ono for her donation of the rights to John Lennon's music to Amnesty International. Bono and Yoko spoke about being an immigrant and specifically about John Lennon's struggle with the powers that wanted to deny him an Immigrant Visa - a Green Card into America. 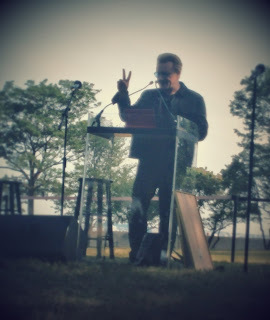 Bono claimed all the Beatles as Irish- it was a fun and humorous speech. Later they unveiled what might be described as a Yellow Submarine crossed with Manhattan-Whale Tapestry in the Registry Hall of Ellis Island. Lennon appears on the top of the commissioned Artwork holding a peace V sign. Because I am a social justice singer, an Irish immigrant who sought a green card and also a musician/song-writer I felt connected to this events theme and participants. I'm just a wee bit less well known right now. And also as a Songwriter-Artist I feel a connection with John Lennon not only because I love his writing but because of a very vivid dream I once had. In the dream (it felt mucho real) John Lennon sang a song to me called "All I want is Everything". I tried to later recapture the feeling of this experience when I woke up. through his words at least... and Bono mentioned that during the 1970's Lennon whispered in his ear "to dare" ...dare to love and to dare to make music. "Dare to give peace a chance. Will we?" "Imagine for a minute you had to leave your home involuntarily." 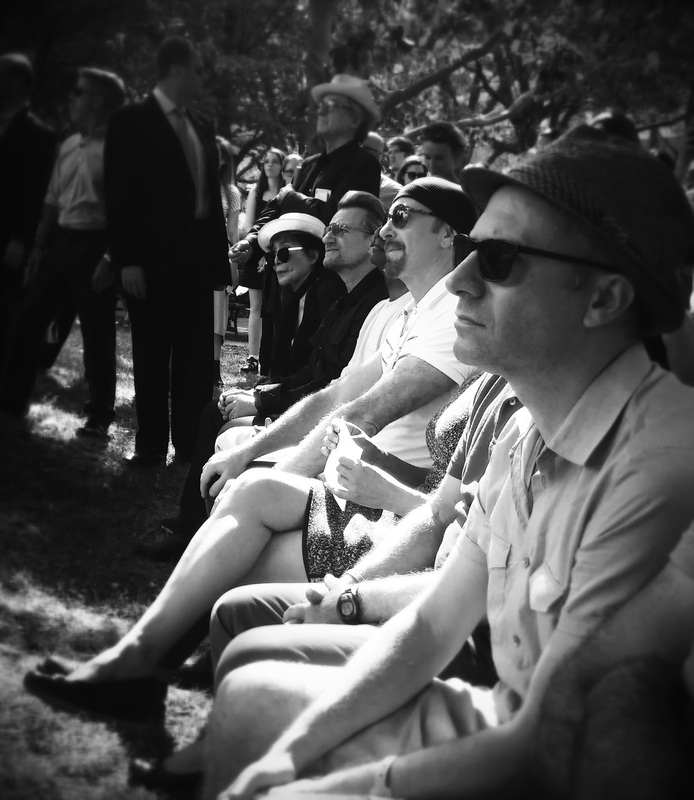 We are all wayfarers, visitors and in some way immigrants through an impermanent world. Who knows whether I met the real Lennon or I dreamed him all up (cause its a dream!) but I had some sort of experience of watching him sing live, a song that was titled "All I want is Everything". I said to myself while inside in the dream- I wouldn't have thought of that title. Of course! I wanted to write that song down and in the dream I recalled making a 'note to self' - you'd better remember this! So I did. he looked like he always did, glasses, combat­-jacket, hair. he sang “All I want is everything” maybe he was really there. he laughed about the book I’d read, about things he might have done.